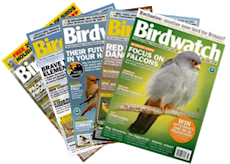 Birdwatch was established by Dominic Mitchell in 1992 as an independent magazine for birders. It grew to become the leading monthly news and features magazine at the enthusiast end of the market, and since 2008 has been part of Warners Group Publications. The magazine is based in London alongside BirdGuides, which is also part of the Warners group. Topics covered each month include bird identification, conservation, where-to-watch guides, overseas destinations, avian taxonomy, species profiles, and news, reviews and comment. Some published material is archived on this website, and as well as publishing a print edition Birdwatch is now also available in digital format with additional media such as video clips, image galleries and sound files. Birdwatch works with organisations such as the Royal Society for the Protection of Birds, the British Trust for Ornithology and BirdLife International to help promote conservation and research initiatives, and to raise awareness of and support for selected projects and campaigns. As an Associate Sponsor of the British Birdwatching Fair and publisher of the official programme, we have contributed more than £240,000 towards worldwide conservation causes identified by the event’s organisers in partnership with BirdLife International. Read more about some of these important projects here. As part of this work, the magazine has acted as a BirdLife Species Champion for the Critically Endangered Azores Bullfinch, with important funds donated to local BirdLife partner SPEA for conservation of the species and restoration of its habitat. In the Champions of the Flyway (COTF) project, the Birdwatch-BirdGuides Roadrunners team has raised a further sum of approximately £17,500 towards BirdLife International conservation work, include the protection of birds of prey migrating through the Caucasus in Georgia and COTF projects to combat the illegal slaughter of birds in Greece, Cyprus and Turkey.